There’s something just unique about watching a “Feel Good “movie. The often follow an underdog character and take viewers down their road, experiencing and bombardment of trials and tribulations along the way before reaching a rousing triumphant ending, which ultimately will leave you (the viewer) feeling great. In addition, these movies, which most (if not most) are base-on-a-true-story, are usually inspirational, showcasing several common threads off expression individuality, facing personal challenges, and inspiring others in their footsteps. Whether true or fictional, “Feel Good” movies are always treasured treat to watch. Now 20th Century Fox and director Dexter Fletcher brings you the newest “Feel Good” movie of 2016 with the film Eddie the Eagle. Does this movie soar high or fall flat on its face? In 1987, Eddie Edwards (Taron Egerton) is consumed with making the British Olympic Ski team, nurturing a dream of one day participating in the Olympic games ever since he was sickly child. Supported by his mother Janette, (Jo Hartley) and stubbornly dismissed by his father Terry (Keith Allen), Eddie, ever the dreamer and eternal optimist, decides to go for another big dream for Olympic achievement, switching to ski jumping to improve his chances with a sport that Britain long abandoned a long time ago. Heading to Germany to train alongside Olympian hopefuls, Eddie soon discovers the painful reality of height and velocity when practicing ski jumping, taken a brutal physical punishment as he tries (and fails) over and over again. Coming to help the wayward youth is Bronson Peary (Hugh Jackman), a former jumper and current alcoholic who takes a liking to Eddie unwilling spirt of determination. In time and with Bronson by his side, Eddie qualifies for the Olympic Winter Games in Calgary, plunging head first into the daunting challenge ahead of him to prove his tenacity in front of a global audience. As I said above, “Feel Good” movies are somewhat of a special thing to watch. You know that they maybe a little predictable or sappy, but it’s usually drums up emotion when watching them, with a you (the viewer) cheering or rooting for the main character at the end of the feature. Some of my favorite movies are label as “Feel Good” movies or have a “Feel Good” feeling about them, including Finding Nemo, Remember the Titans, Cool Runnings, and Secretariat amongst many others. Thus, it kind of got that feeling when I first saw the trailer for the movie Eddie the Eagle. Since the trailer was light-hearted, I saw it almost every time I went to the movie theater these past couple of months, so I to say that was the least bit curious to see was sort of an understatement. After seeing the movie, I found that Eddie the Eagle, despite the standard problems that usually accompany these movies, was uplifting and definitely an inspiring underdog story. Eddie the Eagle is produced by Matthew Vaughn (the director behind X-Men: First Class and Kingsman: The Secret Service) and several others. However, the directorial duties of this feature belongs to the actor-turned-director Dexter Fletcher. Fletcher, who has made appearance in several features like Long, Stock, & Two Smoking Barrels and in HBO’s miniseries Band of Brothers, takes an interesting stance when crafting Eddie Edwards story as a cinematic tale. Rather than keeping the narrative stale (like a classic bio-pic drama film), Fletcher takes certain liberties to the story, keeping the movie very light and sort of whimsical, but in a good way (I personally think so). That not to say that Fletcher keeps the standard troupes of a “based-on-a-true-story” movie (and there’s plenty of them), but Eddie the Eagle definitely has its own charming “swagger” to it. 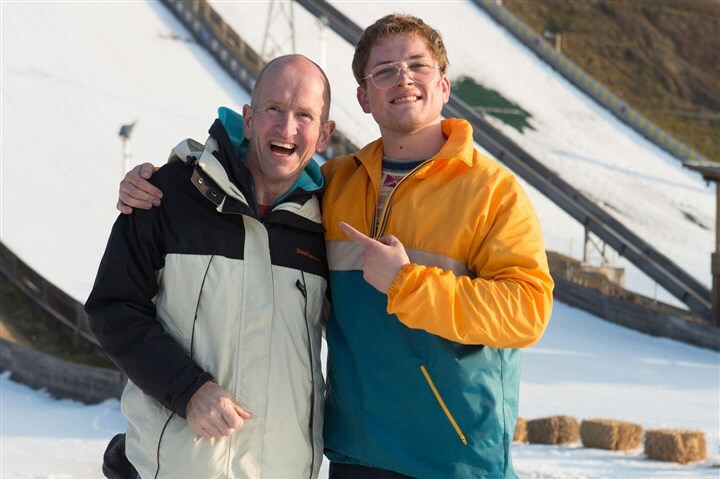 To me, even though the story is based on a real-life person (Eddie Edwards), Eddie the Eagle feels more like a fictional inspirational movie rather than a true-life-drama film. It’s clear that there were a lot of liberties taking in making this movie (I did research after seeing the movie and separated fact from fiction) and found that somethings that were altered and some that could’ve been added into the film’s final cut. It’s still a quality film, with a core message of facing fears, overcoming adversity, and inspiring determination. Thus, despite the narrative being reworked, Fletcher, along with writers Sean Macaulay and Simon Kelton, keep the spirit of Eddie Edwards alive in the movie, sustaining the core fundamentals of what the story represents. Filmmaking-wise (or at least in terms of cinematography), Fletcher takes advantage of showcasing the ski jump backdrop in Eddie the Eagle. There’s a sheer grace in watching all the ski jumps, defying gravity with elegance and awe-inspiring moments (thanks to cinematographer George Richmond), but there’s also the dangerous pitfalls of jumping (and failing to land properly). It’s an interesting contrast and, after seeing the movie, I definitely have a better understanding and appreciation of any ski jumper, whether Olympic athlete or not. Aesthetically speaking, the movie captures the long and feel of the late 80s (hairstyle and clothing), which is always good thing, as well as the celebratory Olympic games in Calgary. Lastly, the movie’s score, composed by Matthew Margeson, is (to me) pretty cool with a whimsical retro 80s vibe. Even the film’s usage of 80s songs in the movie fits and feels appropriate for this movie. Keeping up with the film’s premise of being quirky and charming, upcoming British actor Taron Egerton, known for his role as Eggsy in Kingsman: The Secret Service, plays the film’s central character of Eddie Edwards masterfully. While other performers might have play the standard gawky and peculiar hero architype, Egerton has that eccentric innocence and charm that brings Eddie to life, in a very loveable manner. Even seeing the physical look of him (big props for the makeup department) and cheeky quirks are endearing to watch, proving to be the film’s greatest strengths. In short, while he may not when Oscar nomination in this role, it’s really hard not to like in with Egerton’s Eddie. Of course, Hugh Jackman, Eddie the Eagle’s big ticket star, is a quite the scene-stealer in the movie, playing the somewhat disgraced athlete Bronson Peary. Interestingly, Jackman’s Bronson is an entirely made up character for the movie (another liberty with Edwards’s actual story), with a separate story arc for the character. Though its fabricated, Jackman shines in the role, playing the role of mentor / coach for Eddie beautifully with enough mainly bravado, humor, and likeability to play the tough / gruff Bronson. Beyond Egerton and Jackman, the rest of the cast (all of which are in supporting roles) have their moments in the film’s spotlight. This includes Eddie’s parents (played by Keith Allen and Jo Hartley), the snooty British Olympic official Dustin Target (played by Tim McInnerny), and small role for BBC broadcast announcer (played by Jim Broadbent). Christopher Walken’s character Warren Sharp, Bronson’s former Olympic coach, has a role to play to Bronson’s narrative arc, but seems a little underdeveloped. It’s not from Walken’s acting ability (which is always good), but rather his character seems like an afterthought in the movie. Eddie Edwards goes for the Olympic gold in the feature film Eddie the Eagle. Fletcher’s inspirational base-on-a-true-story movie is a positive type movie that succeeds with its overall quirky underdog premise and from its loveable performances from its two main leads. It may embellish parts of the story, but the movie still retains its endearing message for dreamers out there for both kids and adults (and me too). Personally, it was great. I knew where the story was going to go, but still terrific fun watching it as I would recommend it all to who love these types of movies or (at the very least) if you’re a fan of Egerton or Jackman. In a genre or in a subgenre (some people call it that) where the story / main character can be a little dry and stale at times, Eddie the Eagle is a charming change of pace. Definitely a top contender for the “Feel Good” movie of 2016. Oh, I agree with you. It was a very charming movie. These types of movies usually get good reviews, but are not “box office” successful.